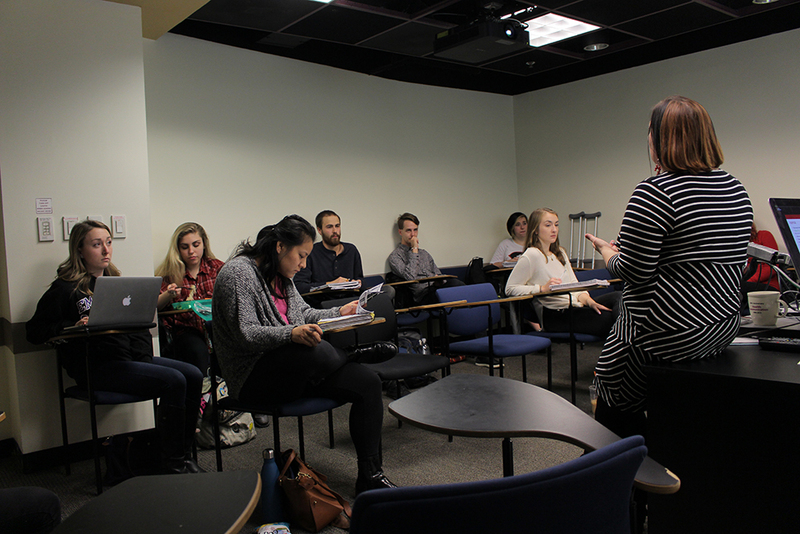 The War on Drugs class is partnering with local organizations to combat drug abuse. An Emerson class is partnering with the Boston Public Health Commission to combat substance abuse. Students in “Topics in Health Communication: The War on Drugs” are undertaking service learning projects using skills from their majors to create communication and marketing resources for the BPHC. The instructor, Nancy Allen, M.P.H., said that while the 20 hour service learning projects were optional, all of her 20 students opted to participate. Students are producing materials for Addicts Health Opportunity Prevention Education, Overdose Education and Narcan Training, and Providing Access to Addictions Treatment, Hope and Support Program. Allen said that the biggest concern in substance abuse treatment is overdose prevention. “People can’t get into treatment and recovery if they’re dead,” she said. She described the partnership with the BPHC as a “win­-win,” because students provide the external programs with media resources which they might not otherwise have access to and students get to build their portfolios. Students formed groups of three or four and each chose a project with one of the partnering companies. Cylvanna Elgadi, a sophomore marketing communication major who is writing print material about overdose prevention, said that the topic is emotionally charged for many students. Haley Spielberg, a junior journalism major in the class, said that she is working in a group to produce informational brochures for the PAATHS Recovery Program. According to the Boston Public Health Commission’s website, PAATHS provides information to the public about addiction and overdose treatment services. The students spent the first half of the semester learning about the history of each major drug category. “It allowed me to understand why people [...] have certain preconceived notions about certain drugs,” Spielberg said. She said that Allen’s openness, relaxed demeanor, and frank teaching style were refreshing. “It’s the first time that I’ve had a discussion in an academic setting about drugs with just the facts,” Spielberg said. Allen said that the second half of the class would examine patterns related to incarceration and legislation, including racial and ethnic disparities. She plans to have students write essays outlining their own hypothetical drug policies, as though they were lawmakers. Allen will teach the class again next semester, and said she hopes to do so again in coming years. “I don’t see the war on drugs going anywhere soon,” Allen said. Beacon news staffer Bret Hauff, who is in this class, did not contribute the reporting of this article.